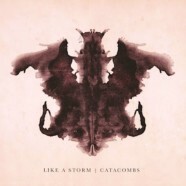 Like A Storm will be touring in support of their brand new single, “Complicated (Stitches & Scars)”, off of their third studio album, Catacombs, which was released this past summer via Century Media/RED MUSIC. The record, which debuted on the Top 5 Billboard Heatseekers Charts, Top 50 Billboard Emerging Artist Charts, and Top 100 Billboard Album Charts, was produced by Like A Storm’s very own Chris Brooks, Matt Brooks, and Kent Brooks. Like A Storm has toured the globe with some of the biggest names in rock – including Alter Bridge, Slash, Ozzy Osbourne, Shinedown, Three Days Grace, on top of headlining North America extensively. They have also been invited to perform at the world’s biggest hard rock festivals including: Download (UK), Nova Rock (Europe) and Rock on the Range (U.S.). Their reputation for touring the world relentlessly led Myles Kennedy of Alter Bridge/Slash to once label them, “The hardest-working band in the business.” Like A Storm recently wrapped a massive U.S. run supporting Godsmack & Shinedown, where their high-energy live show garnered thousands of new fans on social media. Sully Erna from Godsmack invited Like A Storm up on stage to perform a cover of ACDC’s “Highway to Hell” at their final show in Texas. Like A Storm is Chris Brooks (vocals), Matt Brooks (lead guitar), Kent Brooks (bass guitar), and Zach Wood (drums).